The City of Girona had a problem. How do you light a busy traffic and pedestrian bridge in the middle of a highly sensitive environment in the countryside? 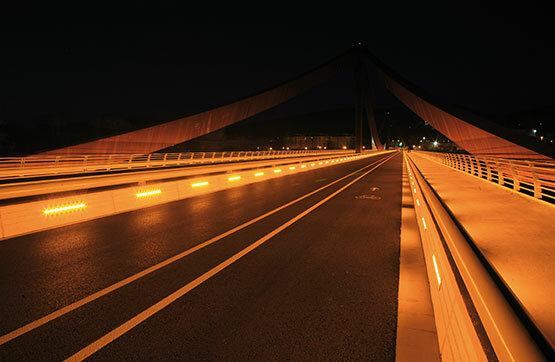 The new, 486m long, bridge of Girona (NE Spain) crosses a valley in the middle of a natural park and it was essential that the lighting did not disturb the wildlife or the environment. The bridge is 20m wide and is constructed of welded Cor-Ten steel cables which give it an aged appearance. The suspension bridge crosses the river Ter and is situated in an E1 Environmental Zone which means that maximum protection for light pollution is needed. The light should respect the flora and fauna, especially with regard to insects which feed at night. At this point, the city developed a collaboration with the local lighting cluster CICAT (Cluster Iluminación de Cataluña) and a luminaire manufacturer, Ignialight, who is one of their members. It is well known that insects and many forms of wildlife are sensitive to Cool light sources which contain short wavelength (blue) light. This is especially true of LEDs which typically have a peak around 450nm. The solution was to develop an LED luminaire which does not emit any light below 500nm. IgniaLight specially developed a recessed linear luminaire, made of extruded aluminium and polycarbonate, which has a CCT of 1800K and is amber in appearance. This is similar in colour to high pressure sodium but it is much more controllable and the colour rendering of CRI 40 is much better than HPS of 25. Furthermore, the luminaire emits zero upward light. This means that it does not contribute to skyglow and it minimises any possibility of light pollution. Using this luminaire, the roadway and footway are safely illuminated and at the same time, the natural flora and fauna are not disturbed. 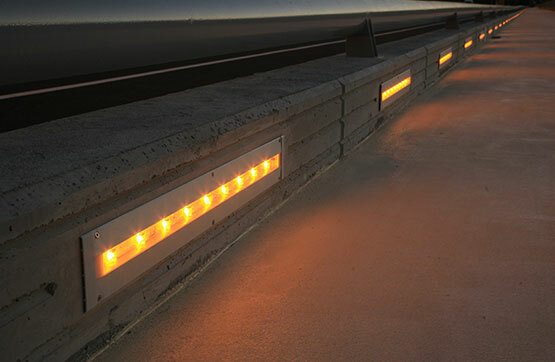 It is hoped that this system can be used wherever lighting is required in an environmentally sensitive area. CICAT is a non-profit organization with the main goal of enhancing the competitiveness of the lighting industry of the region with the execution of cooperative projects and activities. There are three main lines of development: Internationalization, Innovation processes and Knowledge Management. 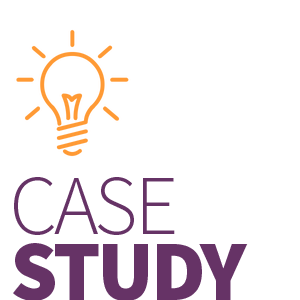 It was founded as an association in September 2010. The number of current members is 30 which counts for the 60% of the total regional turnover and 24% of nationwide (Spain) value in SSL business. Its actual members cover all steps of value chain, from design, prescription, engineering and manufacturing of product and processes to additional services: lab testing and certification. There are also component suppliers and a research institute.